Want to talk about real estate? 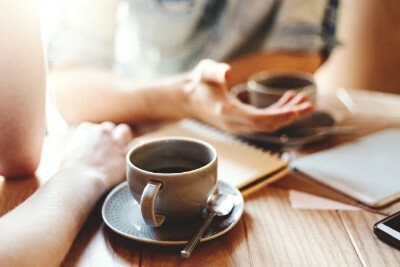 Let’s get together for some coffee and just have a conversation. At Josh Lavik & Associates we believe that in order to best help with your real estate needs, we must start off with just a conversation and listening to what’s happening in your life. Buying or selling your home is BIG deal and you deserve the very best. If you’re thinking of downsizing to a condo or upgrading from a starter home, there are some significant things to consider as you transition from one property to another. Certainly the logistics of making a move like that are tough, but knowing how to make it happen smoothly can be a challenge. As first time home buyers we were very skeptical about the type of treatment to expect from a realtor. We were expecting someone who was out for themselves, trying to make as much as they can off of us. I am so thankful that I was recommended to see Josh Lavik. He is so friendly and explained everything in a way we could understand as this process was all new to us. Working with our schedule and short timeline Josh and his team worked together to fit as many showings in several weekends as possible. They went out of their way to fight for the lowest price on our home, but gave strategical advice at the times when we needed it. Nothing felt pressured with Josh and his team. It was our decision at every step. After we bought our home, they helped us understand the closing process and prepared us for all the financial shenanigans that came with it. They went above and beyond even after we purchased the house. We borrowed their moving truck for free, as well as a pressure washer to wash our new home. I couldn't have asked for better service, as I wouldn't know what to ask for. Thank you all for making this experience as easy as possible! We have purchased and sold a few homes over the years and Josh Lavik and Associates is by far the best real estate experience we have ever had! Extremely Professional! A big thank you goes out to Julie! Josh and his team are great professionals who respond quickly to emails, texts, and calls. I appreciate their willingness to be patient with me when I am being impatient with the process. They know their industry and support their knowledge with data that they share with customers. I also appreciate their commitment to giving back to the community and their clients. They are the real deal in my mind! Josh Lavik and his team were always promptly on top of every aspect of the sale of my home. He and they were always warm, friendly, professional and concerned. I had the easiest time with the sale. I knew everything was handled in the most top notch way and I had not a single worry even though I was 200 miles away during the process. He scheduled an open house right away, loaned me a power washer to clean the outside of the house, and I had never seen such thorough, professional, and positive marketing materials for a home for sale. My home was sold in less than two weeks and he guided me through the multiple offers that I received. I would highly recommend Josh and His team! COULDN'T RECOMMEND ANY MORE HIGHLY!!! We bought our house with Josh about 6 years ago and then sold with him in 2018 and he is the best. He is extremely reachable and responsive...he came to our house to discuss strategy prior to listing...the pictures he took of our house and help with staging were incredible...and he helped us sell our house for $18k over asking on the first day we started accepting offers! Stop your realtor search now, go with Josh and I 100% guarantee you won't be disappointed. Josh was really helpful and knowledgeable and he had guidance and when the time is right I hope we can do business so if you’re looking for guidance Josh is the person! Josh and his team did a truly excellent job. Josh helped not only with drafting the contract, but also with lining up inspectors and negotiating around the problems that we uncovered. And we loved being able to take advantage of their moving van! Amazing team! Great communicators and hard working to get us the house we really wanted. Thanks you Josh Lavik and Associates. We've already recommended them to anyone we know looking to buy or sell a property.Tons of added benefits too, thanks for the moving truck to help us move all our stuff, we'll have to use the bounce house when the weather gets nicer. Josh and Julie were phenomenal to work with while selling my home out-of-state. Responsive to texts, emails and phone calls. Josh was knowledgeable about the market, kept me informed every step of the way, and provided the perfect balance of advising and listening. He helped me navigate through a series of offers and counter-offers, explaining each so that I could make a sound decision, and demonstrating skill with various negotiation tactics. He even answered my early morning call the day of closing and drove out to let the Salvation Army in to the property...and mailed me the donation receipt afterwards. Julie helped me understand what to expect at the expedited, remote closing and made sure everything was lined up with the title company and buyer. This awesome team gets an A+. I can’t thank Josh and Julie enough for all of their help during my housing search. They cheerfully worked around my whacky schedule, gave in-depth explanations of otherwise inscrutable details of the housing market, and showed infinite patience through the entire process. There was no pressure at any point, they were always working hard to find the right property at the best price, and I always felt like I was their top priority. Josh even helped out with a water heater issue after I closed on a condominium. I never would have expected that kind of service from a real estate agent who’d already made their commission. I wholeheartedly recommend them to anyone looking for a home in the Madison area. When I was searching for a new place to live in June, I happened to be put in the capable hands of Joshua and Julie at Keller Williams. I was panicked and didn't have much money to buy a place and these two people were constanly reassuring me about how they will do anything to help me find a place or with anything I'd need. The very first day I went looking for a Condo with Joshua, I wanted to see a number of places but figured Joshua had other appointments and would never have time to show me different places. But, I was wrong for Joshua took me to every place I wanted to see and even back to a place we already looked at just to make sure. Well, the place we saw again was what I could afford and we made an offer on it. We even made a lower offer to see if it would be accepted. It was accepted and the ball was rolling. I was then getting more nervous each day as the offer was accepted. Each day I would get a reassuring call from either Joshua or Julie calming my fears about finances and wanting to know if there was anything I needed. They were also very helpful about finding moving help, (which, by the way, were the two of them offering to help me with a big truck and the whole works.) I've never found or heard of a realtor helping me move. I thought they were kidding, but on the hottest, most sticky day of June they were ready to go and helped me move my things in a big truck. I was completely grateful and was never charged a penny for the help. If I had to move again, I would choose Keller Williams and I hightly recommend Keller Williams for their support and dedication to making my whole experience run smoothly from beginning to end. They are great people! Josh and his team were incredibly helpful in guiding us through the offer/inspection/and closing processes for our home. Josh and Julie were both very responsive to our questions, and clearly brought a lot of experience to the table. And thumbs up to their customer appreciation program--we moved a boatload of stuff in their great van! Now we just need to figure out a time to use the bounce house and margarita maker... We would highly recommend using their team for both buying and selling your home. Josh and his team had great communication and benefits program was great! Josh and his team were friendly, efficient and offered timely responses to all needs/requests. You've been great working with us long distance and especially with the last-minute complications where we couldn't attend closing as planned. My wife and I bought a home in Jefferson which is farther out from the Madison area, and we felt like Josh's team worked with us just as diligently as they would have with anyone else. They were fast to reply and communicate through our entire purchasing process, and were extremely relatable. I would 100% recommend them as a buying agent to anyone looking for a new home! Friendly Staff - Everyone went the extra mile. josh's buyer/seller perks are excellent. Will contact again should I decide to relocate. So far, I have had 4 experiences with buying a new home and using the services of real estate agents. Most of them were stressful experiences that I vowed never to go through again. However, in my last move, my experience went very smoothly. I attribute this to having had Josh Lavik as my real estate agent. Josh was the first real estate agent I have encountered that really took the time to listen to me, to help me find just what I needed. During the negotiating process, he was considerately prompt in returning phone calls and was thorough in attending to every detail. He never pushed me into thinking about something I wasn’t interested in, and he was willing to listen to my concerns. As a person, I believe Josh has integrity. As a professional, he is obviously knowledgeable and prepared as well as enthusiastic about helping people. Josh worked hard for me and I would definitely recommend him as a real estate agent to others. Josh and his team were very courteous and patient with us as we are first time buyers. Thank you Josh for making our first home purchase a lovely one! We are still in love with our home and cannot wait to create happy memories within. Will definitely recommend. Josh helped us locate "sight-unseen" a condo for our child attending University of Wisconsin. HIs responses were prompt, his knowledge of the market broad and his final advice on securing the deal was excellent. Would definitely use him again. Josh is a very professional real estate agent. I would highly recommend him to anyone looking to buy a new home. He worked with us on almost a daily basis to help us find the perfect home that fit our needs and was in our budget. Josh is highly experienced, efficient, and most of all, works for you! Josh helped my fiancee and I purchase a house several months ago, and as first time home buyers he made the process very easy for us. He helped us understand how the entire process worked, and was extremely quick to respond to any type of communication we used (phone, text, email, g-chat). When it came time to make an offer he explained the negotiation process to us and we had an excepted offer at an ideal price within hours of our initial offer. Overall Josh is awesome to work with and I especially recommend him for any first time home buyer in the Madison, WI, area. Josh is infinitely patient! As first time home buyers, my wife and I had a ton of questions, worries, and had a "dream home" in mind. Josh was able to walk us step by step through the process, answered all of our questions, and was always available if we needed anything. Josh helped us make our dream home a reality. If you want a Realtor who will look out for your best interests and help you find that perfect home, then stop looking already....you just found him! Josh is very good at responding to emails, phone calls and texts in a timely and professional manner. I think I most appreciated his honesty while going through the process and would recommend him to anyone interested in buying or selling a home in the Madison area! You can't go wrong with Josh. Hard working, a good problem solver and communicator. He was very responsive and timely on what needed doing. Give him a shot. We were very lucky to have Josh Lavik as our agent. Josh scheduled all showing at our convenience which are after work and on weekends. He provided us with outstanding advice about real estate and the buying process. He promptly returned all our phone calls and email which we do have many for him. He was attentive to our needs and was available to answer any questions that we had. As a person, Josh was a pleassure to work with!! He is easy to talk to, a good listener, easy to contact and above all friendly. Josh came highly recommended by our son and daughter in law. We really liked that he was in close touch with me and easy to discuss things with. He gave us honest opinions and was very knowledgable about the process and properties. He did very well at keeping us updated during the transaction. One thing that really stands out is his patience and professionalism. The most disappointing thing that happened during the transaction was dealing with unreasonable seller's at the first home that we put an offer on. We would recommend Josh as your Realtor and use him again. We selected Josh because he was a friend. We liked his honesty, the fact that he let us take our time, he's not pushy, and he's very accommodating. He does complain once in a while about Charley Horses :-). He did very well at keeping us updated during the transaction. We were most excited when we finally got an accepted offer and did the dance of joy. We would definitely recommend Josh as your Realtor and we would use him again in the future. Josh is personable and enthusiastic. He listens to what you want and need in a home, and his goal is to find that for you. His goal is to get you the perfect home not to sell what he happens to have on the market, and this sets Josh apart. If you meet with Josh, you will leave more energetic than when you began. His enthusiasm is contagious. Josh is my Realtor and has helped me walk through the pain staking process of buying my first house. I always have numerous questions and Josh has consistently been patient and extremely knowledgeable. He also helped me find exactly what I wanted. Josh cares about his clients and works very hard. A true gem in the Realtor world. Top qualities: Personable, Expert, High Integrity. Josh is the consummate professional. I would recommend his services to anyone looking to buy or sell a home because of his dependability, punctuality, and good natured personality. Josh was a pleasure to work with. As a first time home buyer, Josh explained and re-explained the home buying process thoroughly and in a manner that was easy to understand. He has a genuine zeal towards his profession and a great attitude. He was willing to put in the time needed to work around my work schedule when it came to showings and even writing offers. I would highly recommend Josh to anyone looking to buy or sell a home. I wasn't really a fan of realtors, but Josh was easygoing, informed, connected, and took the time to understand what we were interested in. He also helped connect us with the perfect home. Try him out. You probably won't be disappointed. Josh went out of the way to help me find a condo for my daughter. Even though I was out of state, he went the extra mile to send me details and great comps. Even after the sale he continued to help me. As a Real Estate Professional, I appreciated his honesty, integrity and expertise. I highly recommend him. Josh Lavik and his team continue to rule long after we bought our house. Their attention to detail and extreme customer service was present at the time of seeking and purchasing our first home - they answered questions and concerns before we even asked... Now, 7 months after closing, we area still impressed with their continued support. Out home buying experience was awesome from start to finish. Thanks Josh!! Bob and I could not have asked or dreamed of a better experience. From the first conversation through the final use of the moving truck, we were very happy with your team! Thanks again! Josh and his team work above and beyond to help you get your house of your dreams. Cortney was wonderful and Josh's guidance in this first time home buyer experience was invaluable. I would recommend Josh Lavik and Associates hands down to anyone looking to purchase a home! Josh is knowledgeable, quick to respond, and easy to work with. He answers questions honestly and is very resourceful. I highly recommend him as a buyer's or seller's agent. I just moved to Wisconsin on December 1st and got my keys to the condo before the New Year eve. Josh helped me negotiate the condo price below what the buyer is asking for and I was able to stick with my own budget. Not only I got my condo fast and on time, Josh also assisted me moving my furniture to my new place and returning my rental truck. I will definitely ask for Josh again when I am ready to buy a house. Josh is true professional. We worked on a transaction together for a mutual client and Josh had all of the documents to me, organized and complete right out of the gate. This attention to detail makes my job much easier. I always ask my buyers how they rate their Realtor in the buying process and these buyers said that Josh is the best, and that they would definitely use Josh again. As a lender, I hope to have many more transactions with Josh. He is model for agents who want to know how to do it right!